The California Wellness Foundation (Cal Wellness) announced the appointments of Debra Nakatomi, president of Nakatomi & Associates in Santa Monica, and Joseph Lumarda, senior vice president and investment counselor of Capital Group Private Client Services in Los Angeles, to Cal Wellness’ Board of Directors. Elected at the September board meeting, they will commence their service on Jan. 1, 2015. Nakatomi & Associates is a communications firm dedicated to advancing social change, promoting equity and designing awareness initiatives for nonprofit, public and private organizations committed to social good. Nakatomi has served regional, national and global organizations committed to expanding philanthropy for women and girls, promoting health equity and advancing wellness for underserved communities. She is former board secretary and international commissioner for Girl Scouts of the USA and chair-elect of the Little Tokyo Service Center Community Development Corporation. She previously served as vice chair of Asian Pacific Islander American Health Forum and chair of the Los Angeles Women’s Foundation. Nakatomi is co-producer of “Stories From Tohoku,” a one-hour documentary that aired on PBS in 2014 chronicling survivors’ stories of courage and resilience after the 2011 Japan earthquake, tsunami and nuclear disaster. 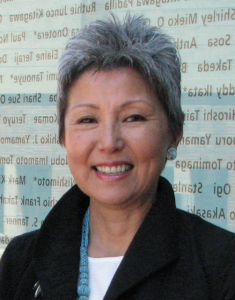 She is co-producer of a film profiling Norman Mineta, who began his early years in an internment camp along with other Japanese Americans and rose to serve in Congress and as secretary of commerce and secretary of transportation under Presidents Clinton and Bush, respectively. Nakatomi received her bachelor’s degree from CSU Sacramento. She is a graduate of UCLA’s Management Development Program for Entrepreneurs, Gallup Leadership Institute, a fellow of the Asian Pacific American Women’s Leadership Institute, and a member of the 2009 Japanese American Leadership Delegation. She is recipient of the Changing the Face of Philanthropy award from the Women’s Funding Network. Nakatomi says she has admired the foundation’s steadfast commitment to funding key health issues. Capital Group Private Client Services is a leading investment management firm. Lumarda, seasoned philanthropic business leader, spent 16 years at the California Community Foundation as vice president for development, executive vice president and chief operating officer. He is the board chair of the Center for Nonprofit Management and a board member of Saint Joseph Healthcare Foundation, Pasadena Child Health Foundation and Southern California Grantmakers. Judy Belk, Cal Wellness’ president and CEO, expressed her delight with the results of the board’s extensive search to expand its breadth and scope. To view videos of Lumarda and Nakatomi commenting on their appointments, visit the Cal Wellness YouTube Channel. Lumarda and Nakatomi join Cal Wellness Board Chair Barbara Staggers, Vice Chair Eugene Washington, and members David Barlow, M. Isabel Becerra, Elizabeth Gomez, and Elisabeth Hallman. The California Wellness Foundation is a private independent foundation created in 1992 with a mission to improve the health of the people of California by making grants for health promotion, wellness education and disease prevention. On Oct. 1, Cal Wellness introduced its Advancing Wellness grants program designed to promote equity through advocacy and access. The grantmaking focuses on three interconnected portfolios: Bridging the Gaps in Access and Quality Care; Promoting Healthy and Safe Neighborhoods; and Expanding Education and Employment Pathways. The program also includes the Opportunity Fund to support innovation in the nonprofit and philanthropic sectors. Cal Wellness has awarded 7,523 grants totaling more than $899 million.